This is an updated version of an original AMT kit. 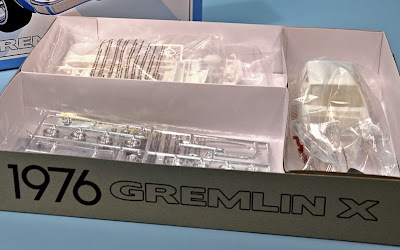 In the metal, the Gremlin - and 1:25 scale finished model - is a smallish vehicle, though this new kit has a box that’s definitely on the big side. Most of the original parts have been restored for this reissue, though the big thing - literally - is the box. This is dictated by the inclusion of an attractive reprint of the original box-art painting, the box being sized to fit the print, a fairly massive 368 x 292mm (14.5 x 11.5in). The ‘original art’ print theme sees the illustration reproduced from archived artwork, rather than being scanned from an old box-top. What’s more, the print is of the car only, minus the surrounding lettering necessary for retail sales. 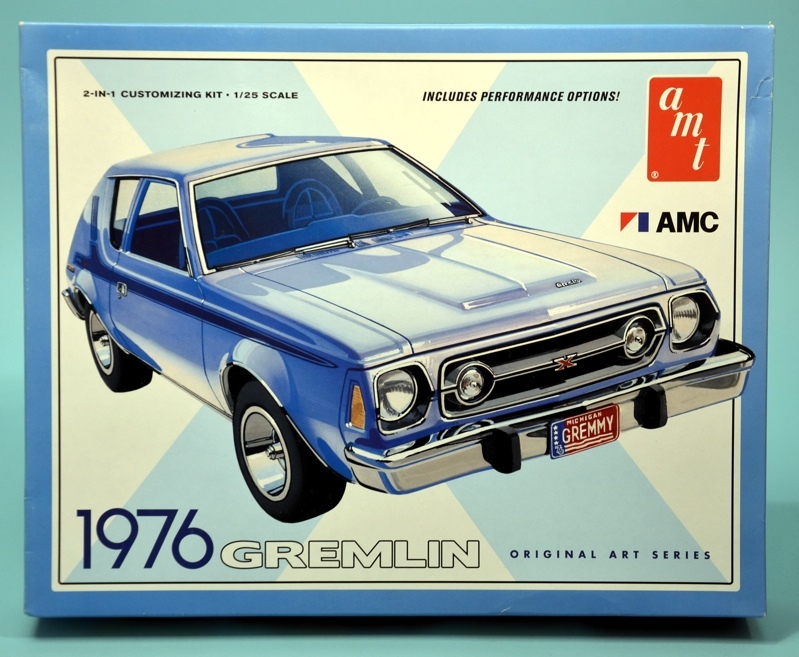 It’s well done, the idea being that you can frame and hang it as a piece of retro-flavour art, an interesting idea that could be used to fill a blank spot in the garage or den wall, especially if you’re an AMC Gremlin fan. The big box provides acres of packing space, and there are three internal partitions - body and tyres in one, main components in a second, chrome parts, decals, and instructions in the third. 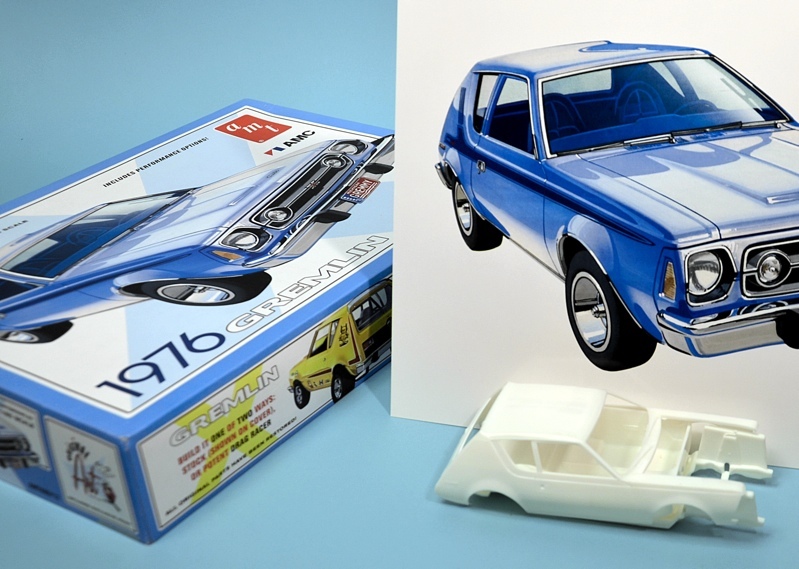 In all you get around 125 parts, mostly moulded in white, with the usual chrome-plated runner and six vinyl tyres, including two newly-moulded hollow Racemaster drag slicks. These are unusual, as slicks are usually produced as solid components. Two sets of clear parts are included, to give you the choice of clear or tinted windows. In this case, the tint is a transparent ‘smoke’ shade, which looks good. A reproduction of the original decal sheet includes the stripes needed to make the sporty Gremlin X option, indicated on the box top and sides. American Motor Corporation (AMC) was the smallest of the ‘Big Four’ car companies that dominated the US auto market in the 1970s. The company itself was a conglomeration of older classic names that included Hudson, Packard, Frazer, Nash, and Jeep. 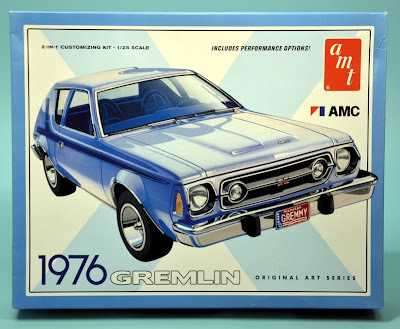 The two-door Gremlin was manufactured from 1970-78, selling reasonably well for a sportyish (the X version, anyway) hatchback, with 671,475 built in all. The final result makes a neat 1:25 scale model, though for an American car it’s on the small side: when assembled it measures just 155mm (6in) long. Sample kit courtesy Round 2. ***SMN Note: I drove one of these for a few days in mid-1980s Calgary, Alberta. 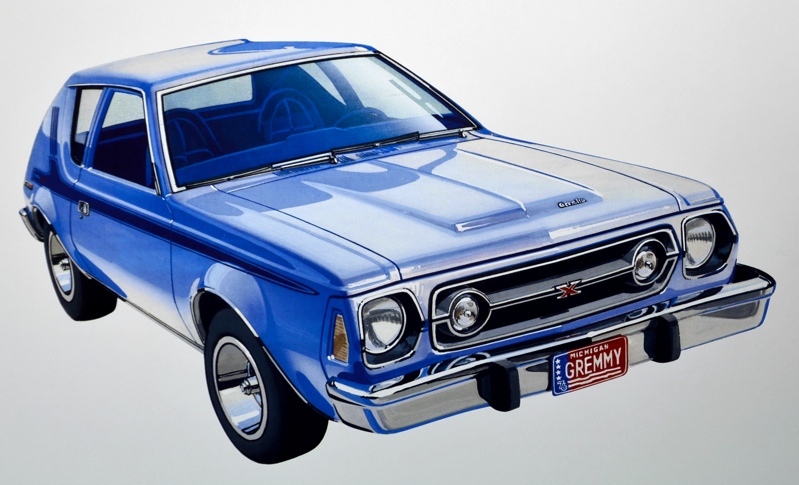 Compared with my tautly excellent VW Golf GTi back home, the Gremlin was like driving a jumble of auto parts, just vaguely connected to form a rolling vehicle. It had some good features mind, such as the useful liftback rear glass, but AMC really needed to put more work into the basic driving dynamics. Shame, as it could have been so much more. I loved Calgary, though! 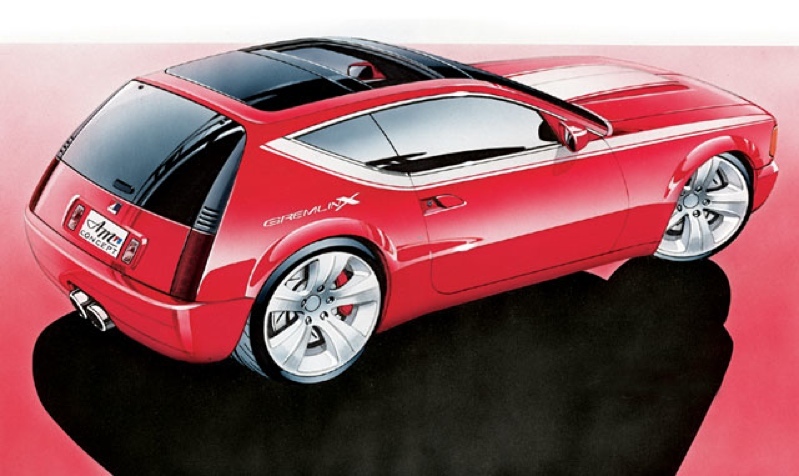 The concept sketch below shows how the Gremlin could have looked - as so often happens in the automotive world, productionizing took away most of the sleek designer looks. In this case, the Gremlin morphed into a somewhat portly reality.